Ashliegh Lisset, an 18 year old singer/songwriter from Dallas, TX, has dreams to sing at Opry by the end of the year. Ashliegh is a beautiful girl with a sweet spirit and engaging personality. Her interest in singing peaked at age 12 after her father died while serving in Operation Iraqi Freedom. The tragedy of dealing with this profound loss made Ashleigh run to music for comfort and ultimately recognize her dream of becoming a performing artist. Just days before he died Ashliegh’s father suggested she record Carrie Underwood’s “Don’t Forget to Remember Me“. Carrie has been an a source of inspiration for Ashliegh from the beginning. As destiny would have it, on August 6, 2013 Ashliegh Lisset released her debut single “Kill the Headlights” written by her idol Carrie Underwood, Luke Laird and Hillary Lindsey. 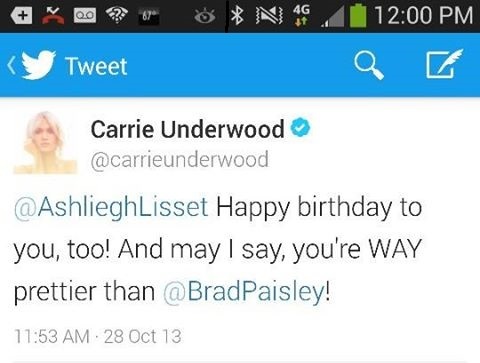 Ashliegh also got worldwide attention when Carrie acknowledged her birthday in the middle of an annual pre CMA twitter banter with Brad Paisley. “Kill the Headlights” showcases Ashliegh’s rich vocals and range with a strong hook. The lyrics are relatable and encourage the listener to jump in head first and grab all life offers. The song is getting positive reviews from her fans strong industry promotion as well. “Kill the Headlights” made its worldwide debut yesterday via Sirus XM “The Highway”. Lisset also announced that she signed a management deal with John Alexander who was drawn in by both her voice and talent for songwriting. The future looks bright for Ashliegh. She said her ultimate dream is to share the Opry stage with Carrie Underwood. With her determination, talent and a little destiny that seems to be on her side this dream may soon become reality.